With taking selfies gradually becoming a big part of what people do with their smartphones, HTC’s Double Exposure event, which took place yesterday, unveiled two new devices to reflect that trend. 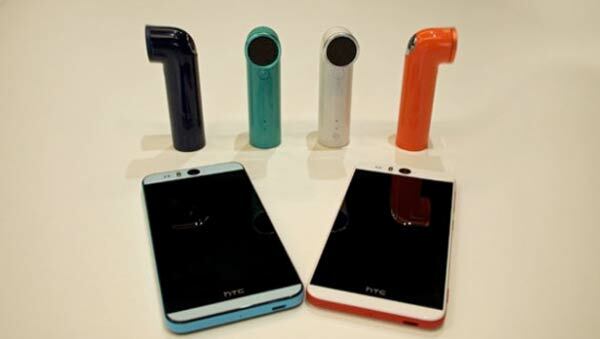 For the lovers of apps such as FrontBack and Snapchat, the company bought our attention to two selfie-centred devices, the ‘HTC Desire Eye’ selfie phone and the ‘HTC RE’ waterproof handheld camera. The new Desire flagship, keeping true to its selfie billing, comes with an eye popping 13MP camera on both the front and back of the handset. The larger than usual front-facing camera receives a dedicated dual-LED flash that is replicated on the back, and is placed above the handset’s large 5.2-inch LCD 1080p screen. Both cameras are capable of recording 1080p videos, where the rear camera has an f/2.0 aperture and a 28mm lens, whilst the front shooter has a wider 20mm lens but a smaller f/2.2 aperture, according to GSMArena. For a mid-range phone, the device comes with pretty impressive specs, better than most of the existing Desire family. It features a Snapdragon 801 chipset with 2GB of RAM, the same found powering the One (M8), and has an IPX7 waterproof rating, making it water resistance up to 1m of water for half an hour. The handset has 16GB of built-in storage, expandable by microSD, and a 2,400mAh battery. HTC’s BoomSound speakers are still on board whilst connectivity wise, the phone boasts LTE, dual-band Wi-Fi a/b/g/n/ac, Bluetooth 4.0 with aptX, NFC and a microUSV port. It runs Android 4.4 out of the box and offers HTC’s two latest camera-centric apps, Eye Experience and the new Zoe. HTC’s Eye Experience camera software suite hopes to take full advantage of the two cameras on board, reports TechCrunch. It has an array of selfie aids, including voice commands, Split Capture double camera feature to shoot both front and back images at the same time, and Crop-Me which intelligently photoshops you into the back camera image. 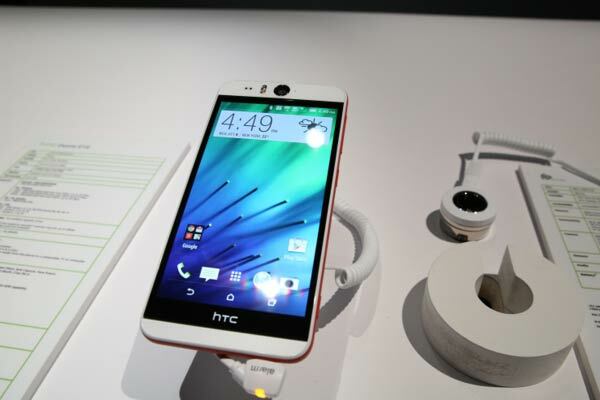 The new app will also roll out to existing HTC devices in the coming months. The pricing information for the Desire Eye has yet been disclosed, but is said to be offered by AT&T exclusively at launch, which will be later on this year. 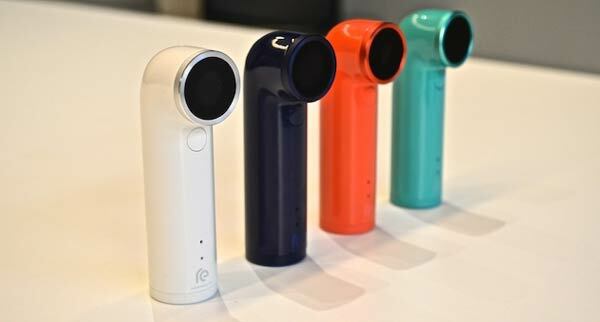 The RE camera is a new gadget HTC suggests as having the potential to “change the face of mobile photography”. The smartphone maker introduced this waterproof selfie camera and software during the event, and it is seen by experts to be a likely contender against GoPro’s line of products. The $199 RE camera is a slim tube-shaped device which can be clipped to a backpack, mounted on a bike to taken underwater. Its software pairs the 16MP camera wirelessly with smartphones and tablets, and allows the devices to stream the footage live and play it back later. The device can also record to a SD card, stream material to a live YouTube channel and send footage to an associated Android or iOS app.